Two reports this week of Red-headed Woodpeckers at Glenhurst Meadows, Somerset County (see this post), motivated this writer to check on the bi-county roaming of this species. Sure enough, an adult was seen and heard in the flooded woodlands of the Long Hill Wetlands in Morris County between the Passaic River and the power line. In relation to Glenhurst Meadows this sighting is east of the river trail where the Red-headed Woodpeckers were seen at Glenhurst. Long Hill Wetlands is north of the Passaic River across from Glenhurst Meadows and is described here in a mocosocoBirds post from August 2013. The wetlands are just that. One can walk the length of the gravel roadway next to the power line, but it is a wet and wild journey north, south and beyond that. In other words, mobility is very limited. 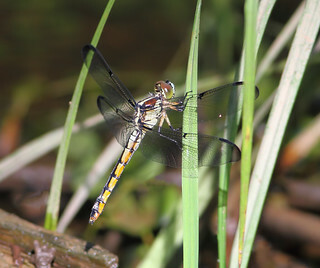 A female Great Blue Skimmer (Libellula vibrans) is also a nice find in Morris County. This is an uncommon odonate in northern New Jersey. In the recent past, the Mendham Golf and Tennis Club lured Purple Martins to nest on the club’s property. Three years ago, local birders noticed an interesting summer evening pattern at Sunrise Lake at Lewis Morris Park. Barn Swallows will hawk insects over the lake and then occasionally rest on the vacant sandy beach. Except – they weren’t alone. One day Purple Martins showed up and joined the beach party. As many as 13 have been witnessed in attendance over the years although usually the number is 3 to 4. The Martins can be seen flying west towards the Golf and Tennis Club as daylight fades, about 1.4 miles away as the Martin flies.